Last night while I slept, my body went nuclear, the weather went nuclear, and worst of all, my Blackberry went nuclear. My body: The progesterone had kicked in, and I swear I slept on my head given the level of bed head I was sporting. The weather: I looked outside and 8 inches of snow were piled up on the driveway. I couldn’t see across the street. I checked the weather forecast and learned we’re under a lake effect snow warning until tomorrow for 18 additional inches and lots of wind. The Blackberry: I can take the cramps and the cold, but Advil and an extra pair of slippers couldn’t cure my Tour. Sometime in the middle of the night, it was sucked into a black hole, and no matter what I did I couldn’t break the loop of reset, restart. Reset, restart. I pulled the battery, tried reloading the OS…nothing worked. I looked outside and sighed. I wasn’t going to spend the day without a phone, particularly one that doubles as a modem here on the tundra. Ergo, I had to find a Verizon store. 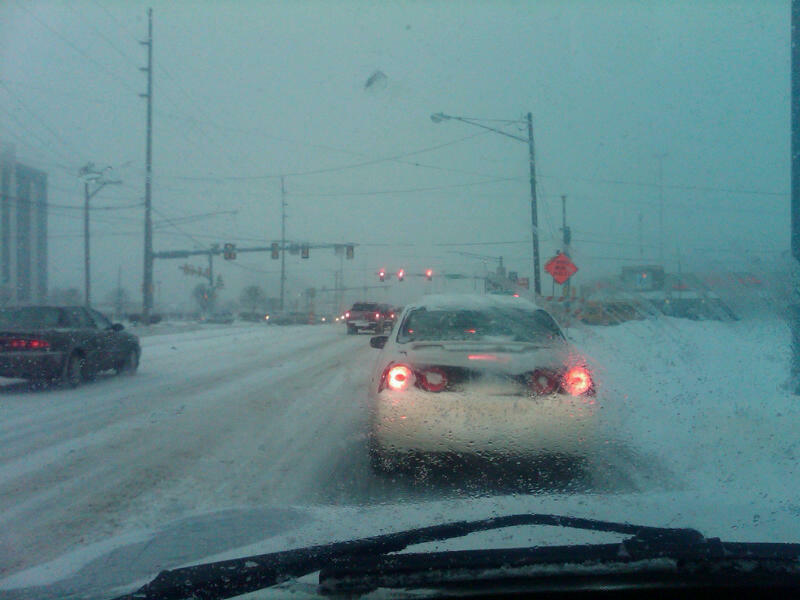 In my defense, I had my lights on when I first ventured out. I’d turned off my car and lights at Auto Zone a block away, so it’s not like I’d had them off very long. I just forgot to turn them on is all. But this guy acted like I’d plotted to ruin his day by not turning on my lights. Still, what did I do? I apologized! Ugh. I hate when I do that. He dropped the f-bomb and I was the one apologizing? He was the jerkface, not me. Didn’t matter, though. I had Armageddon going on my uterus and his words made me want to cry. I didn’t, though. I rolled up my window and journeyed on to the Verizon store. I expected there’d be one, maybe two employees tops who’d made it to work, but heavens no! When I walked in, I was greeted by 9 young sharp-dressed men, many of whom snickered when they saw me. I was covered in snow, you already know what my hair looked like, and – flustered – what did I say to them? ‘Oh I didn’t just say that,’ I thought. But I had. And they laughed. My FFG was humiliated. Why did I feel I had to apologize for how I looked? While one of the guys took my phone away to try and fix it, I sat down and started writing this blog on a couple of deposit slips. I thought about what was really going on. First of all, I was in the throes of hormones, and as such, every little thing in my world felt like it had gone nuclear. OK, I could accept that. Second, just because the world around me felt estranged, it didn’t mean I had to abandon myself, too. Yes, I apologized for things that didn’t need apologizing, but I caught myself before I did it again. Go me! Suffering uterus, bad hair, snow, nuclear Blackberry… There are worse things, and life is what it is. It’s how we react that makes all the difference. Today, as in many days before, I realized that my weight still has a lot to do with my self-image and self-esteem. As I’ve said many times here, just because you lose weight doesn’t mean you lose the baggage. 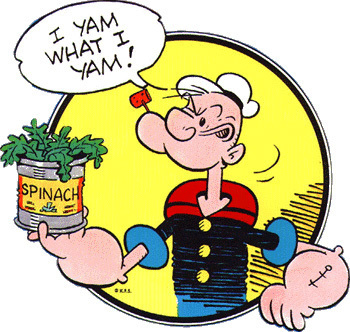 “I yam what I yam.” Today was just another one of those reminder days. How do you respond in the moment of distress? Do you apologize? Run away? Eat? Make excuses? Beat yourself up? And if you catch yourself doing it, how do you work through the moment? This entry was posted in Uncategorized on December 13, 2010 by Lynn Haraldson. I'm sorry your day got off to such a rocky start. When I catch myself mid-whatever, I try to do what you did and recognize what's going on and the reasons for it. I remind myself this is not how I choose to act on things anymore and hopefully, I move on. Doesn't always work, but that's the thought. My gosh, what a day. I am in awe that you ventured out in that storm…I know I'm not a snow girl, but I would have curled into the fetal position in bed for days, especially with the cramp action! Ugh, I hate it when my first instinct is to apologize, especially when other people are acting like such asses. Hard habit to break, though. Hope tomorrow is a much better day for you, from start to finish! I just laughed when you said you had Armageddon going on in your uterus. I just hate those multiple insanity days. Good for you, you realized just who you are. How do I respond to distress? Awkwardly. Then for days I think up clever things I could have said. I don't give a darn what you LOOKED like, you did all that in snow and with cramps? You are my hero for today. I think many women have an apologize instinct and it's one we need to kill. But that truckdriver? Probably would have gotten some marine sargeant language back from me! I loved this post. There is a direct correlation between the number of times a day I apologize and my self-esteem. It crashes more and more with each “I'm Sorry” spoken. Usually takes me a night of sleep to regroup. Yay for you and your quick recovery! You are the woman! The man in the truck obviously has issues and of course his mother has no idea that he is so ruuuuuuuude! You rock! Sorry you had to deal with the nasty lights man, screw him I say lol. Though knowing myself I would have apologized too. I seem to do that in most situations. I'm not very good with thinking quick on my feet and always end up talking to myself later of how I could have done things differently. It's very true we don't get rid of the baggage. But I do try to think at least my actions weren't negative ones to the other person unlike the fbomb guy. Hope you have a better day. Yeah, I'm with Helen. I'd probably have some marine sergeant language going on, at least inside my brain LOL! I'm not really much of an apologizer, but I sure can relate to those days when things just seem to pile up on you. They sure are hard. Love that you made the best of it and started a blog right there in the store. And yes. Can hardly believe you ventured out in the storm. Can I call on you when I decide to take my wagon train over the Sierra Nevadas? I don't know if it helps, but even if it wasn't about the weight, it would be something else to bother about during those awful days…it's the hormones. Try listening to some jokes,maybe they help:).This works for me. It is a very dum advise, but who knows,if you're in a good mood, you'll never reflect on what any frustrated driver might think of you. 1. The guy. I hate to be sexist, but why do most male drivers seem to be this way! They LOVE to point out the errors of women drivers, even when it is their OWN fault! This has happened to me more than once: a male driver pulls out right in front of me, for example, not seeing me in my small car – I honk the horn to keep from getting hit, and the male driver looks over and makes some kind of gesture like it was my fault! 2. The other aspect of this story is when you mentioned that your weight is still an issue. Well, only you would know that, of course, but in no part of your story did you mention that you felt “fat”. YOu felt unattractive, had bed head and no makeup. I think a good lesson for those of us who still have weight to lose – you can feel unattractive even when at your goal weight. The stars don't open up all of a sudden and make one attractive all the time, in all situations. We still have cramps, we still have bed head, and there are still male drivers!